So far this year six cyclists have been killed on the capital’s streets – all six of them in collisions involving HGVs. Five of those killed have been women, prompting Edmund King, president of the AA to describe the collision which led to death of Claire Hitier-Abadie in February as bearing “all the hallmarks of a ‘typical’ London cycling death – a female cyclist killed by a tipper truck turning left”. The dangers that HGVs pose to cyclists are well known. Around half of cyclists’ deaths in London have been the result of a collision with a lorry – despite HGVs only making up around five per cent of traffic. Almost all of those deaths have happened at junctions where the lorry has turned left across the path of a cyclist that the driver hasn’t seen. But are women at more of a risk from HGVs than men, and if so why? Since 2011, 34 cyclists have been killed in collisions with lorries. 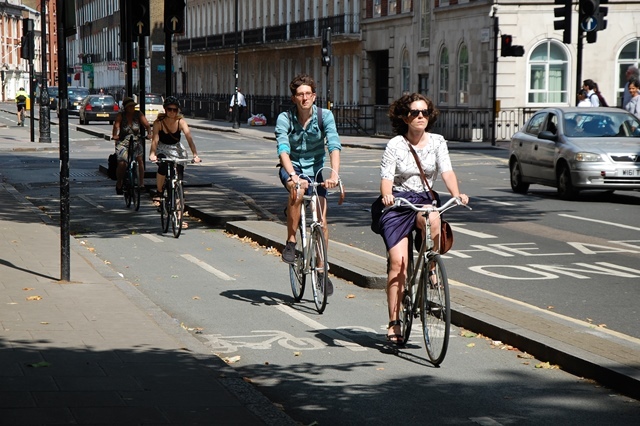 Of those, 17 have been women – despite women only making up around a quarter of cyclists in London. A study carried out in 2012 by researchers at London South Bank University, involving over 4,500 cyclists, suggests that men are more knowledgeable cyclists than women. They found that male cyclists were, on the whole, more likely than female cyclists to know that undertaking on the left-hand side is more risky, and were less likely to do so as a result. She adds: “There are a few key things that will minimise risk. People who are inexperienced or nervous cyclists have a propensity towards putting themselves at risk, thinking that they are actually keeping themselves safe.” This can include things like kerb hugging, or sticking too closely to cycle lanes. Jean acknowledges that cycle training is just one facet of minimising risk on the roads – with other elements such as road calming and cycle awareness training for drivers playing a key role. It’s also important to remember that the number of cyclists killed represents a very small proportion of the numbers actually cycling, and with such low numbers it’s very hard to draw firm conclusions. In 2014, for example, just one of the 14 cyclists killed was a woman. Looking beyond HGVs at the wider picture, it seems that women are actually safer than men when it comes to cycling. In 2013, according to Transport for London statistics, 4,623 cyclists were injured or killed in London. Of those, 3,569 – or 77 per cent – were men. It seems that, when it comes to the risk of HGVs in relation to women cyclists, there are no easy answers. Cycle campaigners in London are calling for all lorries on the capital’s streets to be fitted with safety gear that would reduce the size of their blind spot and alert them to the presence of cyclists nearby. Until then, the advice is to be assertive, pay attention and stay as far away from a lorry’s blind spot as you possibly can.